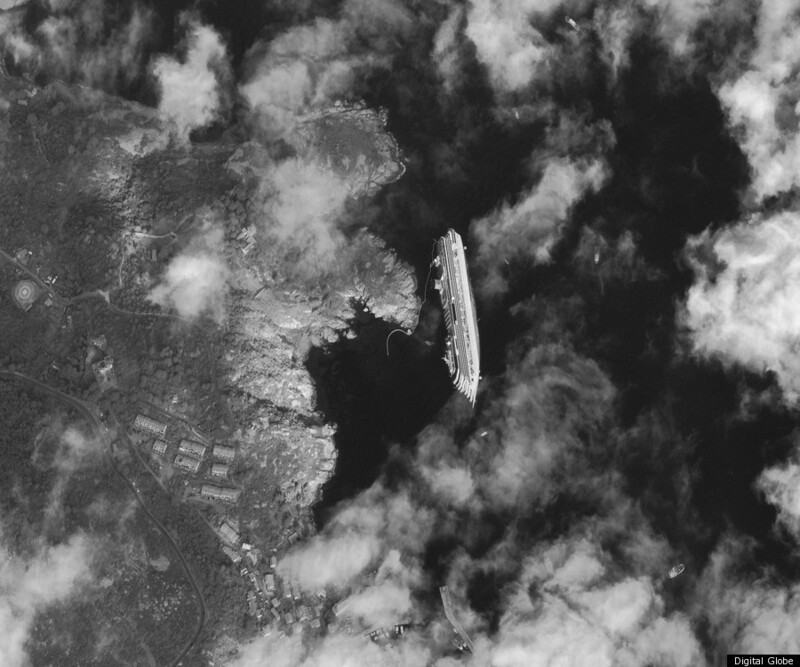 Commercial satellite operator DigitalGlobe has released a high-resolution satellite image of the Costa Concordia shipwreck as seen from space. The Colorado-based aerial photography company operates its own group of satellites and contracts with commercial and government entities for defense, intelligence, mapping, environmental monitoring and other projects, according to their website. The image, which was taken on Jan. 17 -- four days after the luxury cruise liner capsized off the coast of Italy -- shows the massive scale of the disaster and ensuing cleanup effort. Italy's Isola del Giglio, where the ship ran aground, is pictured on the left hand side of the photo. To the right, the Mediterranean Sea separates the island from the Italian mainland, about ten miles to the east. WorldView-1, one of company's three orbiting satellites, snapped the image from 308 miles above Earth's surface, according to Katie Nafius of DigitalGlobe. In an email to The Huffington Post, Nafius said the satellite was already in the neighborhood above the shipwreck and was "specifically aimed to collect this target." DigitalGlobe's other two other satellites, QuickBird and WorldView-2, are also trying to capture new images of the wreckage. However, clouds have thus far obscured those attempts. "They’ve tried taking additional shots, but both images taken today from QuickBird and WorldView-2 were cloudy over the ship," Nafius told HuffPost. "Yesterday’s shot was very lucky, there was a break in the clouds just over the ship!" The ship, which contains several thousand gallons of heavy fuel oil and diesel is currently located inside Italy's largest protected marine area. Italian officials have said that a potential fuel spill "would be a disaster," according to the BBC. According to the Associated Press, the Costa Concordia disaster could also take a heavy toll on the cruise industry, which is just heading into its peak season.